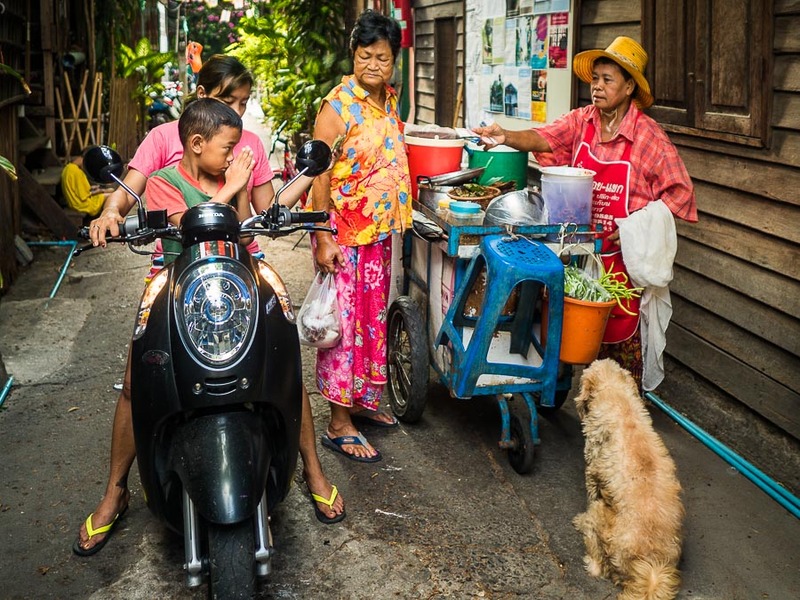 A curry vendor (right) goes door to door in the Pom Mahakan community. The woman and boy on left were thanking her for a meal they bought. 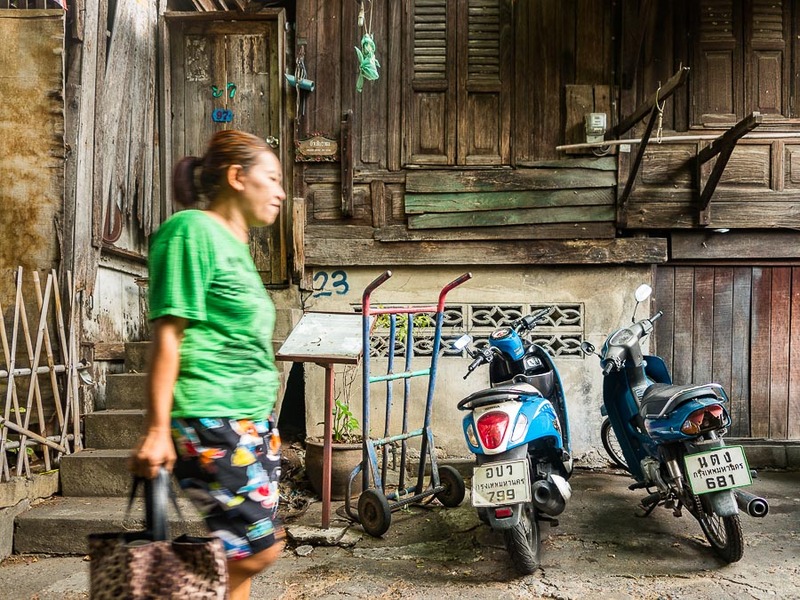 Another community is being evicted in Bangkok. This, sadly, has become routine and the pace seems to be picking up. 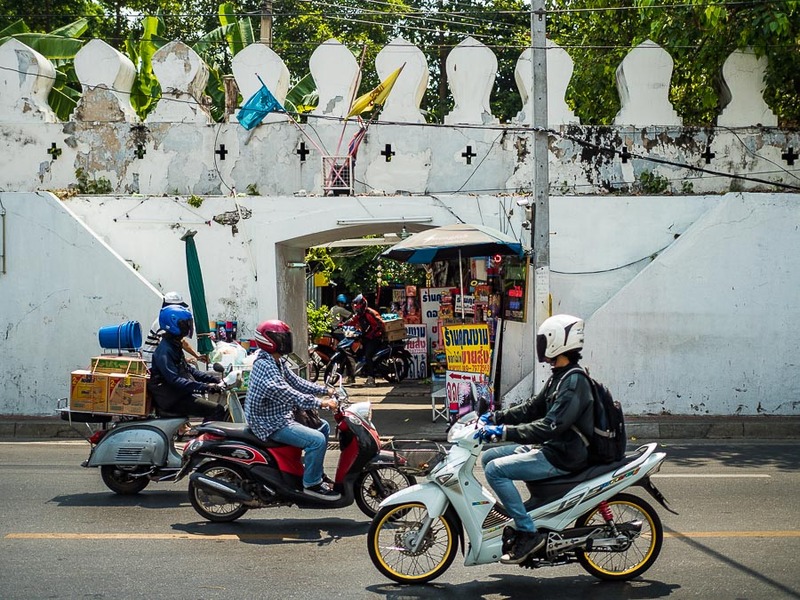 About 50 families live behind the walls at Pom Mahakan, an old fort built to protect Bangkok from foreign invaders. The fort was built in the 1780s on the eastern edge of Bangkok. By the late 1800s, Bangkok had expanded well beyond the city walls and the fort was no longer being used. Motorscooters pass one of the entrances to the fort. People moved into the fort and a community grew behind the walls. It was a tiny city in its own right. There were restaurateurs, teachers, artisans and artists. The first "likay" troupe (a form of Thai opera) in Thailand was based in Pom Mahakan. 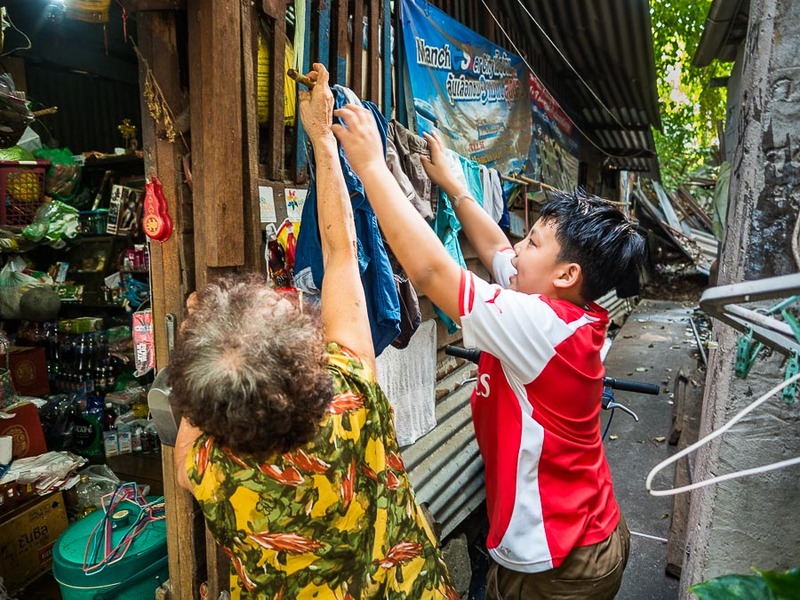 The community was famous for the artisans who made elaborate bird cages that Thais keep their song birds in. It was a famous fireworks making place and is still the center of the fireworks selling industry in Bangkok. It is still the place to go to in Bangkok to buy fireworks although now the fireworks are made in China and imported into Thailand. There was (and still is) a thriving cockfighting community behind the wall. Some of the original homes, now well over 100 years old, still stand in the community. Some have hand painted historic markers, others are buried, time capsule like, among the narrow footpaths that meander through the community. A resident scrubs the sidewalk in front of his home. 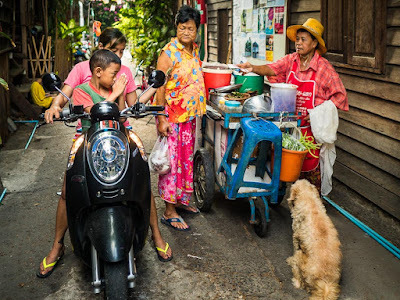 In 1992 Bangkok municipal government took control of the land through eminent domain. Residents were told they would be evicted and the whole thing ended up in court. The courts ruled in the city's favor in 2004, but the city didn't take any action and a sort of stasis set in. Fast forward to early this year. City officials announced plans to go ahead with the evictions and told residents they had until the end of April to find new homes. 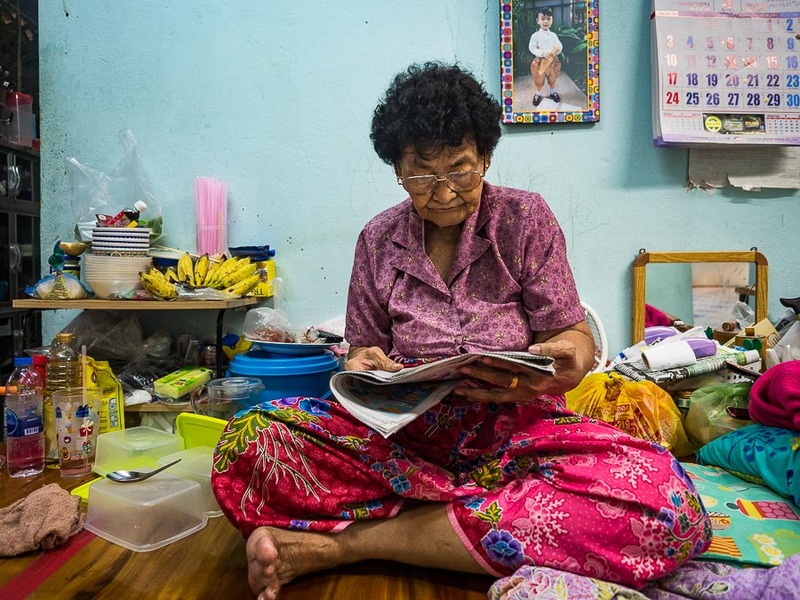 A 79 year old woman reads the newspaper in her home. She has lived in the community her entire life. Her parents lived in the community their entire lives. Her grandparents moved in with the first group of settlers in the late 1800s. She lives with her daughter's family and their children. Four generations have grown up here and being forced out. A boy helps his grandmother hang laundry in Pom Mahakan. Like the other evictions I've photographed in Bangkok, this is a very complicated issue. The residents are now, technically, squatters. They had a land grant early in their history but it expired when the city expropriated the land. The city is within its rights to take the land and the courts have ruled on this. It's open and shut. But this is a thriving community in a city that is losing its history. At one point, city officials and community leaders worked together to promote the community as a tourist destination. Many of the homes in the community still have historic plaques on them, relating the history of the family and the home to passersby. 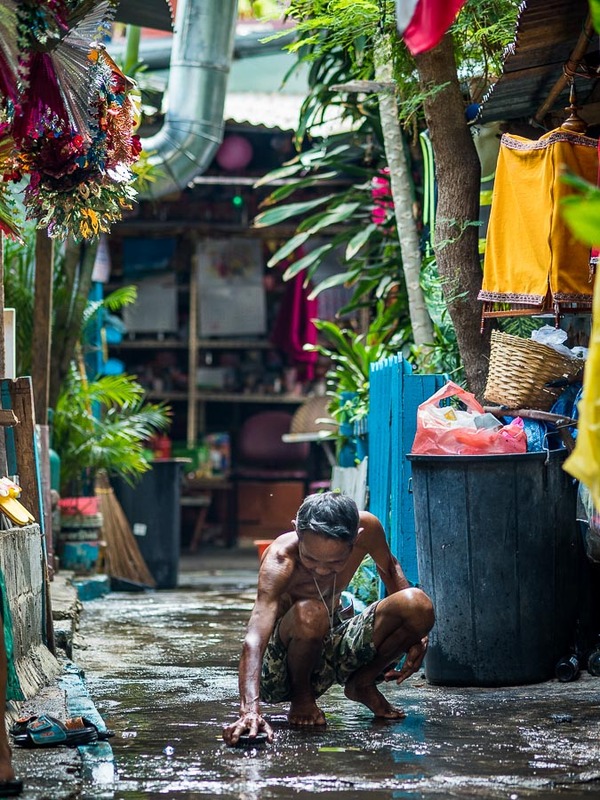 As I've wandered through the community in the last few weeks, people wave to me, we chat, they offer me food and water and display typical Thai hospitality. A resident walks past one of the historic homes in the community. The hand painted sign on the right side of the door said the home was built 200 years ago (when the fort was still a fort) and built using "wedging" (meaning no nails were used in the construction). The concrete base was added several years ago. Before that it was on stilts. The city wants to tear down the houses and replace the community with a park. I think it's a foregone conclusion that the city will prevail. 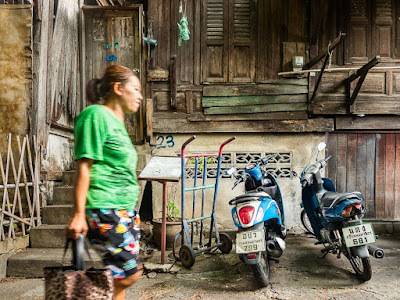 The city, and economic interests, have prevailed at every eviction I've documented so far in Bangkok and I don't see this being any different. The people don't want to leave but they know they don't have legal standing to remain. The sad thing is that it would be very easy to develop the community into a living history museum. It's literally a matter of cleaning the sidewalks, renovating some of the homes (many are in good shape) and redoing the historic plaques that are already there. The people in the community take great pride in their homes and will talk your ear off if you stop and ask them about the history of their lives behind the wall. 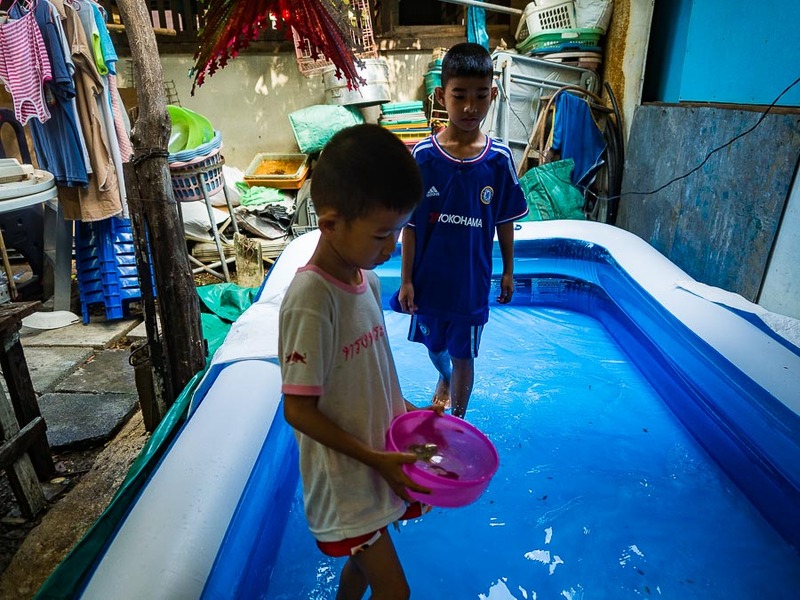 Boys set up an inflatable splash pool between a couple of homes in the community. 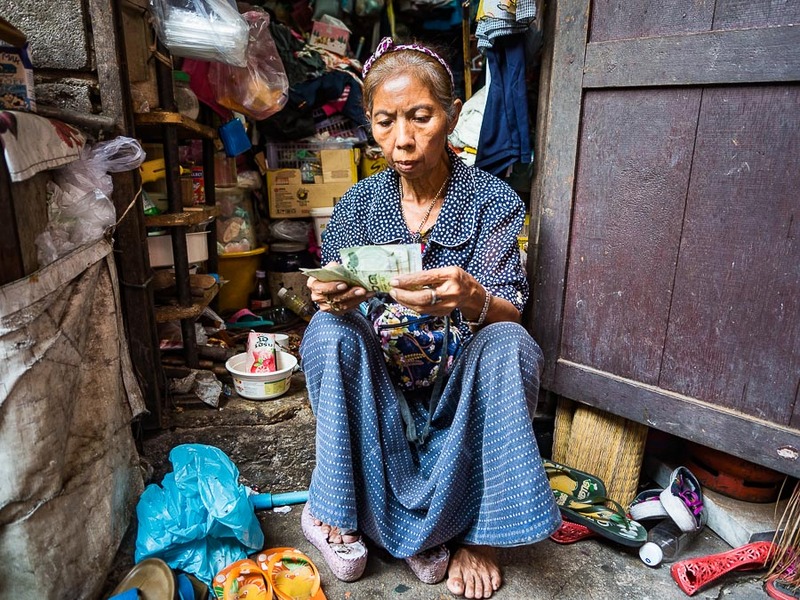 A woman on her stoop counts her money before going to a local market. 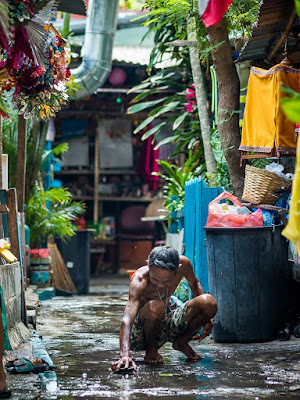 If you're in Bangkok and want to see life in Pom Mahakan you should head down there soon. The people have been given until the end of April to move. The community will be gone by May. There are more photos from Pom Mahakan in my archive or available from ZUMA Press.